ROCK products • NOVEMBER 2014 15 www.rockproducts.com News Briefs According to the latest PacWest Consulting Partners Prop‐ pantIQ market study, North America proppant consumption is expected to increase at 23 percent per annum through 2016, from 80 billion lb. in 2013 to 153 billion lb. in 2016, with much of the growth occurring in frac sand consumption. Growth in proppant consumption is driven by an increasing number of horizontal wells fracked and increased proppant intensity (i.e. increased mass/well).The RCS and Ceramic markets will both grow at 9 percent and 2 percent per annum, respectively. Sup‐ ply of all proppant types is expected to increase moderately through 2016, after substantial capacity increases between 2011 and 2013. Logistics will be challenging into the next few years, causing significant price increases at the well pad. This is due to shortages in railcars, built‐for‐purpose frac sand truck trailers and other factors. However, there should be im‐ provement by 2015. The Winneshiek County, Iowa, Board of Supervisors has ex‐ tended a moratorium on frac sand mining until October of 2015. At a recent meeting, the board made the motion in order to give the Iowa Initiative for Sustainable Communities enough time to finish and compile the results of several stud‐ ies it has contracted with the county to complete. The origi‐ nal 18‐month moratorium on the issuance of any conditional use permits for frac sand mining was due to expire Dec. 3, ac‐ cording to the Decorah Journal. Carbo Ceramics expects ceramic proppant sales to take a hit as drillers try new techniques that require sand proppants. The company also noted increased price competition on ceramic proppant sales from domestic and international manufactur‐ ers, especially in the Bakken play. "We plan to manage the cur‐ rent competitive pricing environment, caused by proppant oversupply, by focusing on sales volumes and introducing new technologies," CEO Gary Kolstad said in a statement. Some Carbo clients are also seeing delays with well completion, pushing some sales the company expected to make in Sep‐ tember to later in the year. The company sees third‐quarter ceramic proppant sales volumes of 375 million lb., similar to first‐quarter sales, as demand for frac sand rises. Frac sand in ambient air does not pose a health concern for Winona residents, according to the Winona Daily News. The first look at eight months' worth of air monitoring data in downtown Winona, Minn., showed silica sand was, for the most part, undetectable. Only two samples taken from state monitors between January and August detected silica in the air, and both were well below the health standard set by the Minnesota Department of Health. "There isn't a silica‐related health issue in Winona at this time," said Minnesota Pollution Control Agency spokesperson Jeff Hedman during a special meeting with local officials and the public, where MPCA offi‐ cials presented results taken from air monitors on top of the YMCA. Victory Nickel Scores Prized Sand Deposit Victory Nickel Inc. announced it has entered into an option to acquire a 100 percent interest in a land package totaling more than 300 acres in southwestern Wisconsin. 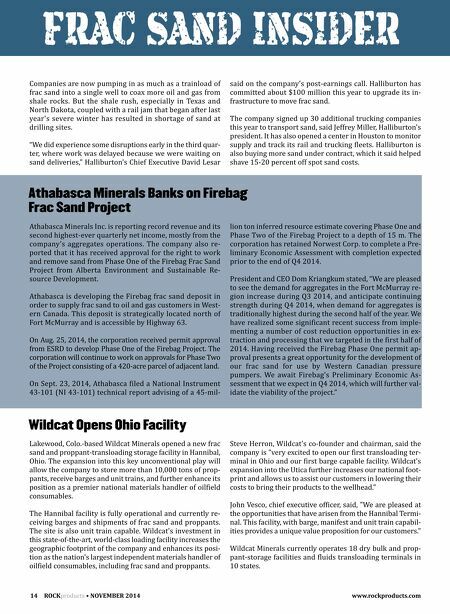 The com‐ pany is specifically targeting a 100‐acre ridge that has been determined to contain one of the highest quality frac sand deposits in North America. This is a Jordan formation sandstone located close to road and rail transportation links. Typically, 40 acres of ridge con‐ tains 8,000,000 tons of sandstone. The company expects to realize 4,000,000 tons of coarse high‐quality Jordan forma‐ tion sand from each 40‐acre parcel. The option agreement provides for a cash payment on sign‐ ing of the agreement, a second cash payment on delivery of permits and a third cash payment on exercise of the option. The option is valid for six months with two equivalent ex‐ tensions available under certain circumstances. Prior to production the company will be required to pay $40,000 per annum as advance royalties on the initial 20,000 tons of sand production. Once the property is in pro‐ duction, the company will be required to pay a royalty of $2.00 per ton of frac sand sold from the property. "This agreement establishes Victory Nickel as a property owner in what is recognized as one of the best quality frac sand producing areas in the world," said Ken Murdock, CEO of Victory Nickel's 100 percent‐owned subsidiary Victory Silica Ltd. "We have now secured a supply of premium‐qual‐ ity Wisconsin frac sand and continue to actively pursue Phase 2 of our business plan which includes the finalization of joint venture partnerships to combine this property with other known high‐quality deposits of Northern White frac sand." 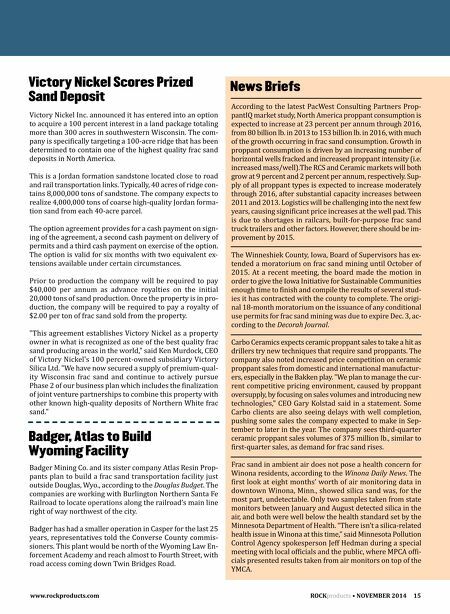 Badger, Atlas to Build Wy oming Fa cility Badger Mining Co. and its sister company Atlas Resin Prop‐ pants plan to build a frac sand transportation facility just outside Douglas, Wyo., according to the Douglas Budget. The companies are working with Burlington Northern Santa Fe Railroad to locate operations along the railroad's main line right of way northwest of the city. Badger has had a smaller operation in Casper for the last 25 years, representatives told the Converse County commis‐ sioners. This plant would be north of the Wyoming Law En‐ forcement Academy and reach almost to Fourth Street, with road access coming down Twin Bridges Road.